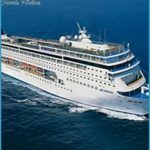 Budget-Friendly: These cruises are affordable to begin with and offer frequent sales, o Unusual Entertainment: While the line’s production shows can lapse into the usual song and dance, novelties such as jugglers, magicians, classical pianists, and opera singers add a really nice touch. MSC Yacht Club Is a Different Product: Splurge on this concierge-class suite level, and you’ll feel like you are on an entirely different and significantly better ship. Language Barriers: Crew and officers have varying command of the English language, creating an environment where rmscommunication is rife and service can be impacted. q Inconsistent Service: Staff ranges from superb to surprisingly inattentive, the latter (most evident among the Italian staff) provoking one guest we met to comment, You get the feeling that everyone has something more important to do than focus on you. These cruises tempt budget-minded travelers with their sometimes shockingly low advertised rates. 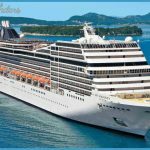 MSC Divina sails out of Miami to the Caribbean, year-round, and has been tailored to suit American tastes and habits (like complimentary table water at dinner and earlier dining times). Like Costa, MSC is a truly international cruise line with plenty of Italian influence. Privately owned, it reflects its Italian heritage in pan-Mediterranean cuisine, grandiose decor, and a very European clientele. Daily programs and shore excursion forms are offered in multiple printed languages, which can create some confusion. On our recent cruise in the Eastern Caribbean, there were some language barriers between us, the crew, and our fellow guests. Trying to cater to North Americans and Europeans all at once is a balancing act MSC hasn’t entirely mastered yet. 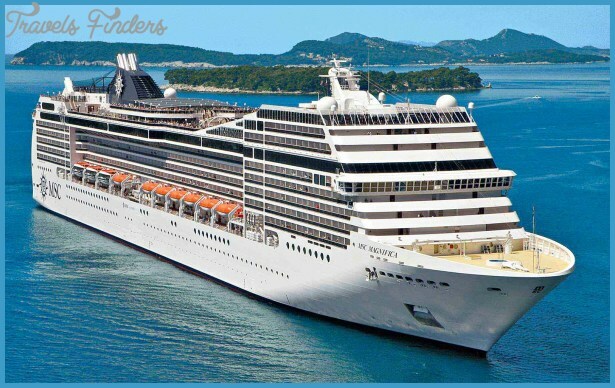 While MSC has but one ship in the Caribbean (sailing alternating Eastern and Western Caribbean itineraries), the line maintains a massive presence in the Eastern and Western Mediterranean year-round, and seasonally in the Baltic, South America, the Indian Ocean, and Africa. 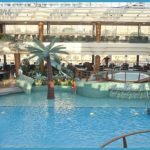 Since those aren’t marketed to a North American audience, we’re only covering the MSC Divina in this guide. Because your fellow passengers are likely to hail from across Europe, you can expect announcements in a variety of languages every day and European-style behaviors, such as late dinners and keeping children up to spend time as a family in the evening. Although European and North American passengers are pretty evenly split on the company’s Caribbean sailings, that doesn’t mean that your fellow guests will want to speak English. That can create some awkwardness or it can be a chance to get to make friends from another country. Your call. Food and wait service have been MSC’s main problem for years, and still needs to improve if the line ever expects to compete effectively with the American mainstream lines. Ships boast a variety of venues, from room service to casual poolside fare to complimentary main restaurants and extra-fee specialty dining venues. Main dining rooms on these ships have traditional assigned tables and seating times. There are also buffet restaurants, but the lines can be long and the food subpar. But that doesn’t mean spending more will get you more here: Specialty restaurants, including pizzerias, ice cream bars, and Tex-Mex spots, are inconsistent in terms of food quality. There are also some quirks to be aware of, both in the positive and negative column. MSC is the only line on which we’ve noticed a kosher category on the wine list and the only line we’ve been on where poppy-seed bagels are a staple at the buffet. (On every other line, it’s plain bagels, period.) On the annoying side, you may have to specially request coffee in the dining room after meals (only Americans do this, several Italian staff members told us), and you may be asked to order your dessert selection at the same time you make your full meal request (just tell them you haven’t decided yet, if you haven’t). Because of the number of languages onboard there are five officially you won’t find academic-style lectures. 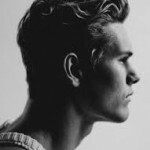 Instead, the line offers more physical activities, such as dance classes and water cycling. 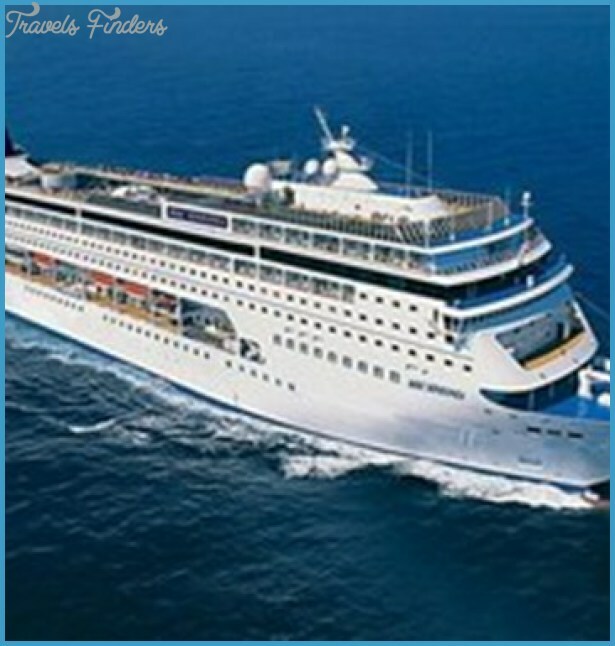 Onboard, the main action revolves around the spas, casinos, pools, and gyms. Children under age 11 sail free and kids from 12 to 18 sail at discounted rates, meaning you’ll see lots of kids onboard on summer and holiday sailings. Along with an ok kids’ club, there’s miniature golf, volleyball, tennis, and on the line’s newest ships water parks. 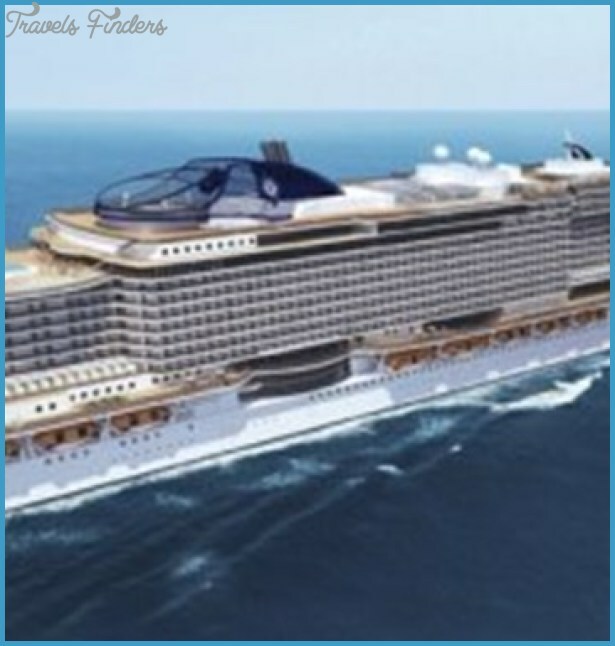 The line is currently the fourth largest cruise ship operator in the world, and has 12 ships as well as several new ones under construction, ranging in size from 2,055 passengers to over 4,000 passengers. Only MSC Divina homeports in North America. 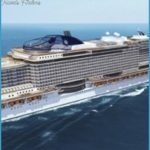 MSC’s largest-ever ship to-date, the 4,134-guest MSC Seaside, will enter service in December 2017 fromMiami. MSC Divina A truly beautiful ship (especially inside), the MSC Divina would be an unbeatable value if it weren’t for her hit-and-miss food and service. Launched in 2012, the 4,345-guest MSC Divina was christened by film star Sophia Loren. Since late 2014, the ship has been deployed (somewhat irregularly) out of Miami and into the Caribbean. Word on the street is she’s there to stay, offering year-round voyages to the Western, Southern, and Eastern Caribbean. Cabins Each grade of cabin on the ship boasts its own unique color scheme, with vibrant shades of red, blue, and yellow, as well as warm earth tones. The majority are balcony cabins, which have full-sized closets and bathrooms with a unique tub/shower combo in select units. Inside staterooms are inexpensive but pretty cramped at between 138 and 169 square feet. Some oceanview staterooms are even smaller, at just 130 square feet, while oceanview cabins are larger, with the biggest coming in at 215 square feet. Though suites aren’t a priority on the ship, MSC Yacht Club suites do include access to a private dining room, exclusive lounge, concierge service, a dedicated lobby, and even a separate sun deck. A total of 45 cabins are designated as wheelchair-accessible. Scene as well as a good cappuccino. A seating area with bar service and a grand piano functions as the base of the atrium; it’s lovely but tends to get crowded, especially at night. 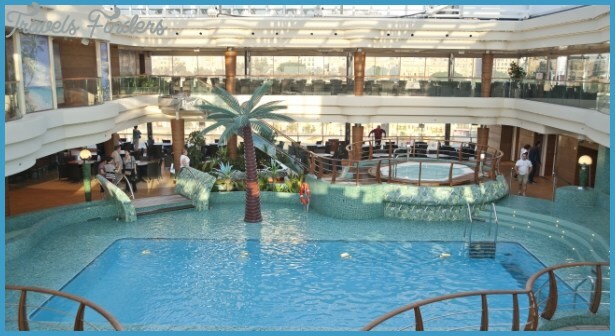 The ship’s pool deck is also attractive, with curving decks, inviting sun loungers, a bandstand, and a place for buying gelato. In addition to hot tubs and swimming pools, you’ll find an oversized infinity pool stretching toward the horizon. Indoors, the Balinese-themed Aurea Spa offers the usual range of massage, wellness, and beauty treatments, as well as two Turkish baths with ornate decorative tiles. The ship’s gym is small for a vessel this size, but it does offer spectacular views. On the nightlife front, there’s the Golden Jazz Bar, a hat tip to the ’70s that flows attractively into La Luna Piano Bar. A central staircase leads down to the understated casino and a re-creation of an Italian piazza under a curved ceiling made to look like a starry sky. Restaurant up on Deck 16, and anEataly Steakhouse (which looks strangely like an IKEA). Additionally, you can grab pub grub in the Sports Bar or try some excellent pizza at La Cantina di Baccio, the ship’s wine bar.